June 2nd is National Donut Day! I’ve already admitted to a weakness for donuts. And I live in L.A., where there are at least 680 donut shops in L.A. County alone—200 more than New York City and three times more than Chicago’s biggest county. That’s a lot of temptation! But mind you, I don’t go for the national franchises like Winchell’s or Dunkin’ Donuts or Krispy Kreme. Nor do I think it’s worth buying the “gourmet donuts” that overcharge for lemon poppyseed and maple bacon bits. I like to support the Mom&Pop places with the pink boxes. They’ve been outlasting their trendy competition for years with just plain glazed twists and old-fashioneds. The pink boxes have their own story. It’s apparently regional and an L.A. thing, but you definitely know what’s inside when someone brings a box to work. Cambodian refugees started it all when they came to SoCal in the 70s and a few entrepreneurs got into the donut business. 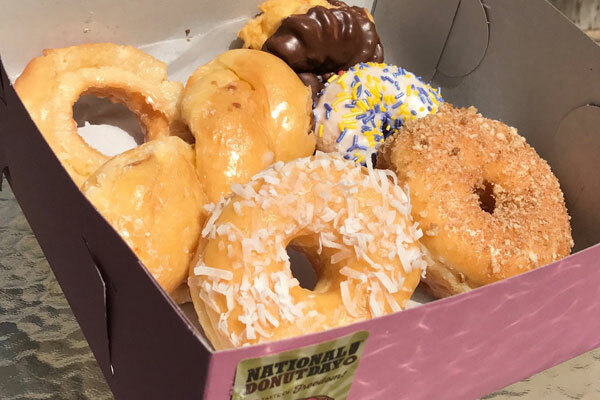 Originally, donut boxes were made of smooth coated white cardboard, but when the main box supplier passed away, a cheaper alternative became more popular among the Cambodian community. The pink boxes meant less cost, plus the color was better for their cultural beliefs anyway—white is associated with mourning, while red is the color of good fortune. Pink isn’t exactly red, but it’s a lot closer than white! You can’t argue with the longevity of the pink donut box, oil stains and all. 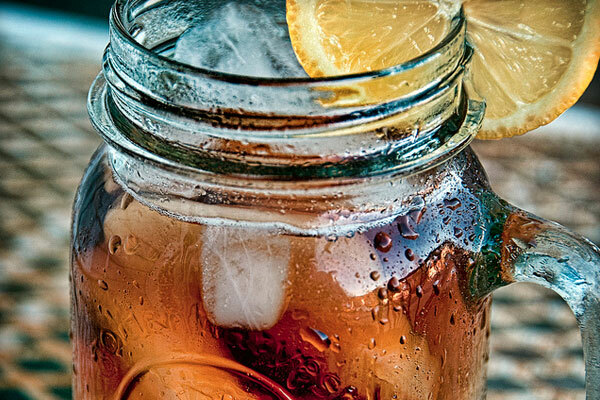 June 10th is National Iced Tea Day! I prefer iced tea over iced coffee, I think. I’d rather have my coffee hot. The problem with ordering iced tea at restaurants though, is that they never have simple syrup around to sweeten your tea. You have to dump granulated sugar in it and clink noisily as you try in vain to dissolve all of it in your glass. I’ve never understood this, since simple syrup is common everywhere in Japan. Of all the varieties of fruity teas, milk teas and lemony teas that you can get today, the version I like best is what I drank for the first time while I was living in Japan. It’s called Brandy Tea and it’s so easy to make I do it at home sometimes when I’m craving it on a hot summer day. You simply brew some strong black tea (Lipton tea bags are fine) and sweeten it as you prefer. If you do this when it’s hot, it saves you a lot of clinking. I like mine pretty sweet because you have to compensate for the ice to be added later. Then pour it over a glass full of ice and stir to chill. The final amazing ingredient is just a small amount of cognac or brandy, maybe just a teaspoon for a tall glass of tea. Don’t worry, there’s not enough alcohol to make it a boozy drink—it just blends perfectly with the sugary, robust tea and adds a completely different dimension to an ordinary iced tea. The best way to drink iced tea, IMHO. The day when us Dads finally get our due, even if it’s only one day a year. No, I’m not complaining. It’s great being a Dad and I love the attention, but I’m not the type to need things because I already have everything I could want. I’ll have to start dropping hints soon so my family can spend wisely on me. Take me out to dinner? Nah—breakfast or lunch is fine at our local Hawaiian place. 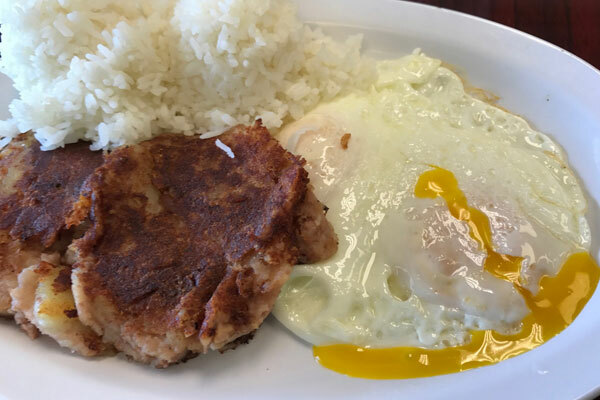 Corned Beef Hash & Eggs for breakfast or Loco Moco for lunch; I wouldn’t complain about either. To be honest, what I really like is my wife’s homemade Spam Musubi. We always have good quality rice in the house, a very good cooker (Zojirushi of course), and good quality nori sheets. She always slices the Spam in generous thicknesses and she uses a secret sauce to flavor it (I think it’s from a bottle, but she won’t tell me what kind). Keep fresh in plastic wrap and I’m good for Sunday and the day after for my lunch at work, LOL! Gifts? Maybe they can get me a set of Legos so I can build the AT-AT Walker and recreate the Battle of Hoth from The Empire Strikes Back. 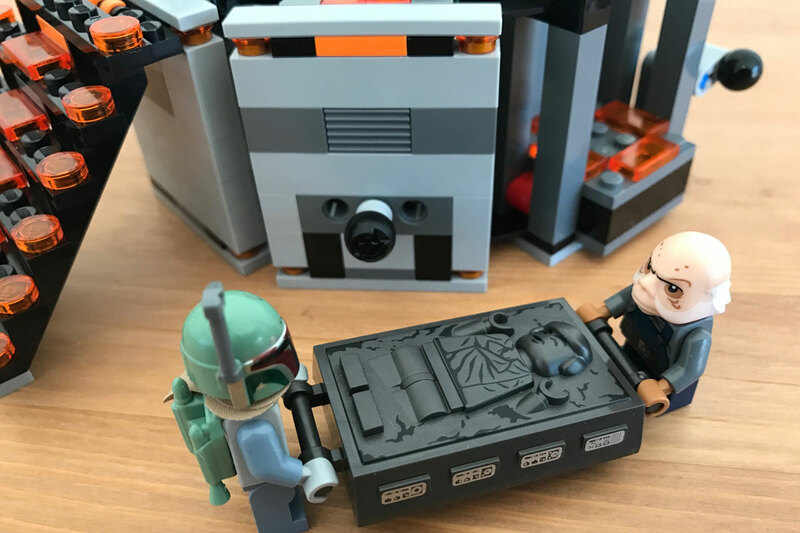 Did I ever reveal that I was a Star Wars and a Lego nerd at the same time? Here’s the carbonite freezing chamber from that movie. 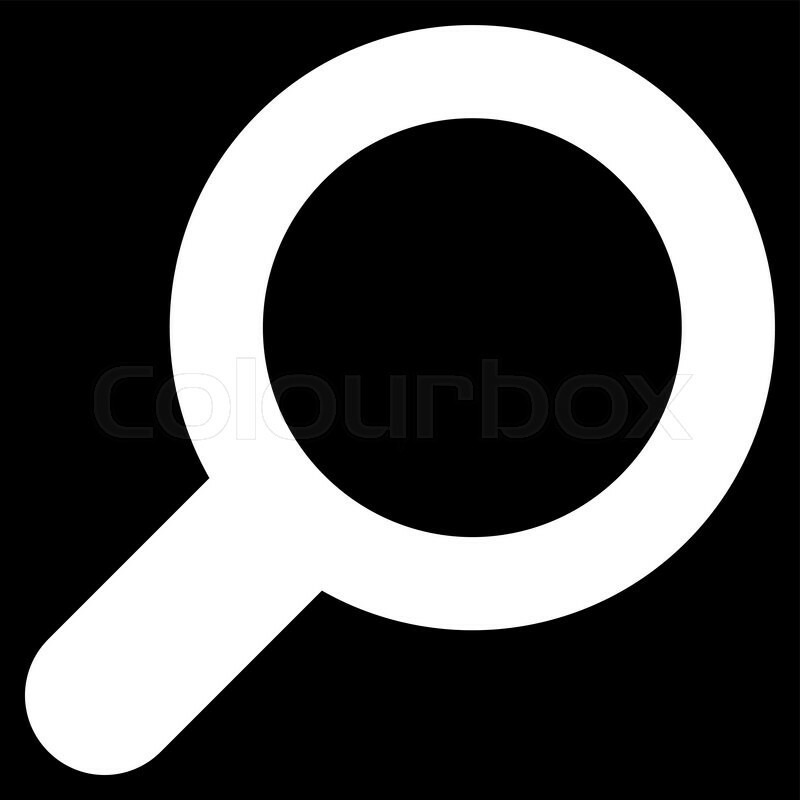 Enlarge to see the detail! June 20th is National Ice Cream Soda Day! To certain people that even care, there apparently is a difference between an “ice cream soda” and a “float”. I guess the old-fashioned ice cream sodas were made with seltzer water, ice cream and a flavored syrup of one kind or another. The classic ones were mixed with chocolate syrup. A float is the same thing except with pre-flavored soda like Coke, root beer or orange soda. 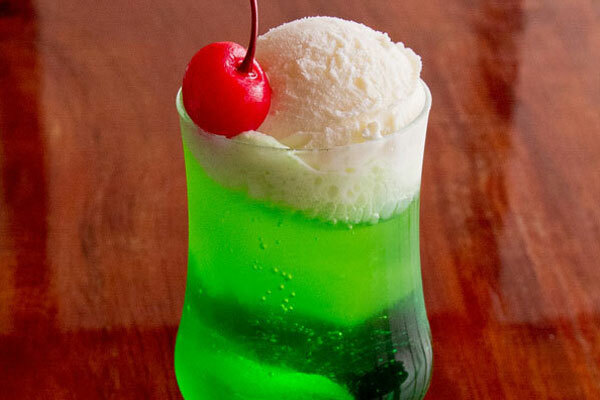 Personally, my favorite kind of ice cream soda is the Japanese “Melon Cream Soda” that’s difficult to get here. This is the classic (in Japan) green drink that I would always ask for when I was a kid. It’s easier to make your own than trying to find one at a Japanese restaurant here—get some green Melon Soda at a Japanese market, drop in a scoop of vanilla and you’ll see why some of us never outgrow it! June 21st is the Summer Solstice! The first day of summer and the longest day of the year! Living in the hot, humid days of summer in Tokyo, I used to hate summer—twice a day showers, loss of appetite, having my glasses fog up everytime I stepped into an air-conditioned building, dreading that my next train wasn’t air-conditioned, etc. But SoCal summers are the best time of year for me now! I can’t help but appreciate the longer daylight, and we don’t get humidity! I don’t miss summers in Japan. 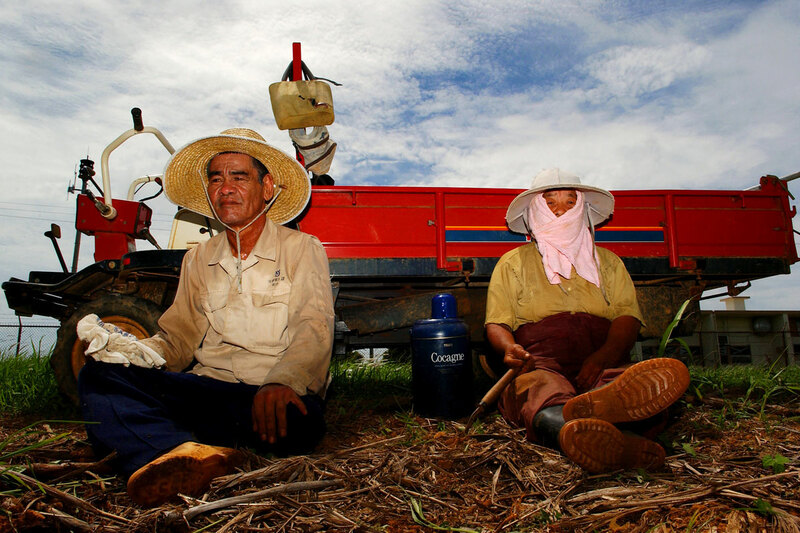 Shown below is a farmer couple taking a break from the heat after working the sugar cane fields of Okinawa. So if June 21st is the longest day of the year (for the Northern Hemisphere), when we get the most direct sunlight, why isn’t it necessarily the hottest day, too? Because earth’s oceans take longer to absorb and release heat than the air or even land. Even though we’re getting maximum sun in June, the oceans and the land are still relatively cool from recent spring temperatures. Gradually though, the effects of the sun catches up and all that heat starts to release into the atmosphere—which is why the hottest summer temperatures start to take effect in late July or August. So logical! May is a beautiful time to visit Japan. The air is fragrant and the mild, sunny weather makes it perfect for sightseeing. One of the most famous places in Japan is Hiroshima, and this month we explore its signature dish, Hiroshima-style Okonomiyaki, along with some history and culture about the area. Hiroshima Prefecture is located in the Chugoku Region of Japan, at the western-most end of Honshu Island, which is Japan’s main island. On the west coast, the Chugoku Region is bound by the Sea of Japan, and on the east coast, by the Seto Inland Sea. Hiroshima Prefecture lies in the center of this region, bordered by the Seto Inland Sea on the east and the Chugoku Mountains along the northern border of the prefecture. Five areas comprise Hiroshima Prefecture, including the Hiroshima City area, the Miyajima Area, Onomichi/Fukuyama Area, Northern Hiroshima Prefecture and Bihoku Area. Each of these diverse areas offer travelers and foodies much to experience! Known as the “City of Water” because of the six rivers that flow through it, Hiroshima City lies at the coast of the Seto Inland Sea and serves as the administrative center of the prefecture. The city was originally founded by Terumoto Mōri in the 16th century as a feudal town, and served as gateway through the mountain passes in the north and an important trade center along the sea coast. Hiroshima City is famous for many things–from the fresh oysters that have been cultivated there since ancient times, grilled to perfection, to the rich cultural diversity brought by traders. Visiting Hiroshima City today means visiting Hiroshima Castle, Shukkei-en Garden and the red Taho-to Tower at Mitaki-dera Temple, as well as the Genbaku Dome and Peace Memorial Park. 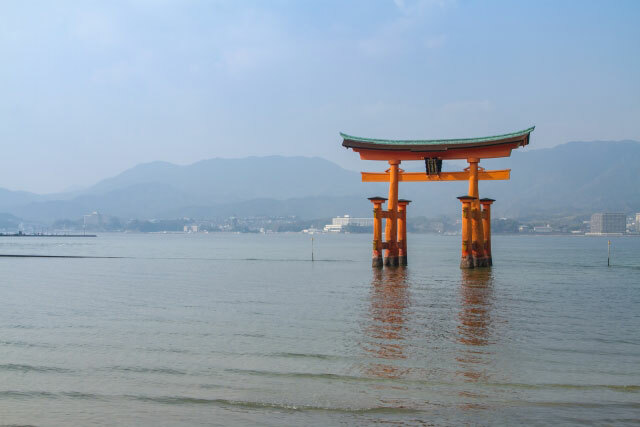 Miyajima Island, formally known as Itsukushima Island, is famous for the awesome sight of Mt. Misen and the glorious Itsukushima Shrine. Mt. Misen is considered one of the most beautiful spots from which to view the islands of the Seto Inland Sea and from which to enjoy the virgin forests that are designated as a national natural monument. When not climbing the peak, visiting the Itsukushima Shrine and the accompanying Ōtorii or Grand Gate are a must. Both were built in 593 and to this day, seem to float in the waters of the sea itself! Depending on when you travel, don’t miss the Water Fireworks extravaganza. Miyajima Island is a ferry ride from the coast, and when returning to the mainland, visiting the Onomichi / Fukuyama area provides a wonderful trip to a scenic port town and temples from which to enjoy the view. And in autumn, when the maple leaves dramatically change colors, trekkers flock to Northern Hiroshima Prefecture and the Bihoku area to climb in and out of the valleys and ravines, catching glimpses of the sea and mountains. 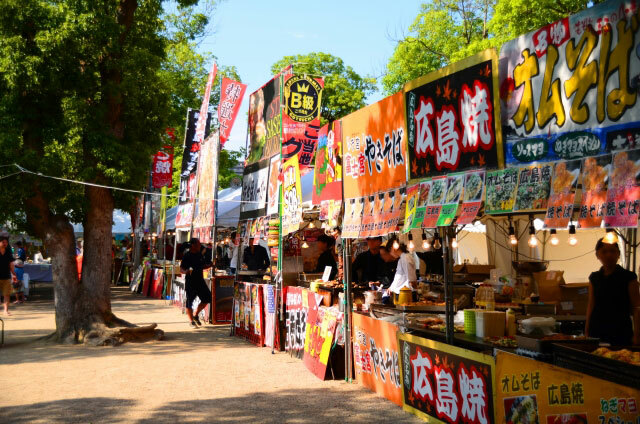 Traveling all over Hiroshima Prefecture is sure to whet your appetite! 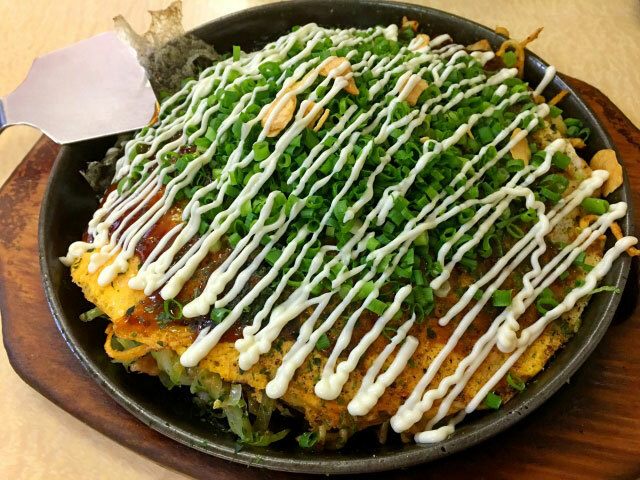 Along with fresh, grilled oysters, Hiroshima is famous for its okonomiyaki. Okonomiyaki is a portmanteau from “okonomi” which means “as you like it” and “yaki” which means “grilled”. The Hiroshima-style okonomiyaki, also known as hiroshimayaki, was conceived of in the 1950s, during which time it provided inexpensive food for the population recovering from World War II. Hiroshimayaki is made by layering ingredients, as opposed to mixing finely chopped ingredients into the thicker pancake-like batter as is popular in the Osaka area. The traditional form of hiroshimayaki is a thin layer of crepe, dried bonito powder, shredded cabbage, tempura scraps, thinly sliced green onions and bean sprouts topped with pork belly and another layer of crepe. 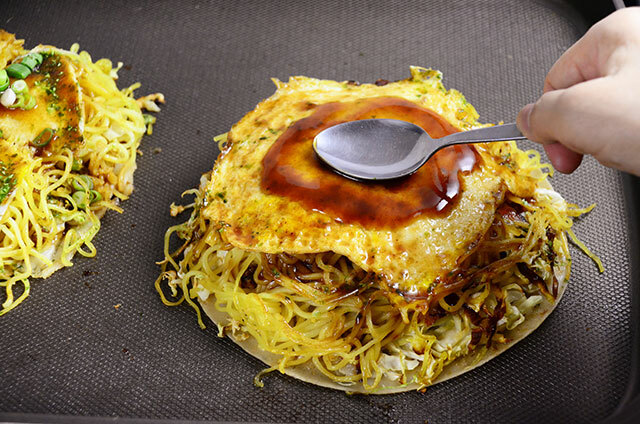 Once that has cooked, it’s further topped with yakisoba noodles stir-fried in okonomiyaki sauce and a fried egg. All of which is further topped with more sauce, mayonnaise and dried green seaweed powder. Want to make the resulting goodness? Try out our recipe for Okonomiyaki, Hiroshima-Style! It’s easy to make using our electric griddles and so very satisfying! As always, share your pictures with us…and tell us how you like to top your okonomiyaki! It’s spring and we want color! Our new Stainless Mug (SM-SC36/48/60) is a lightweight, portable mug that lets you take hot or cold beverages with you, wherever you go! 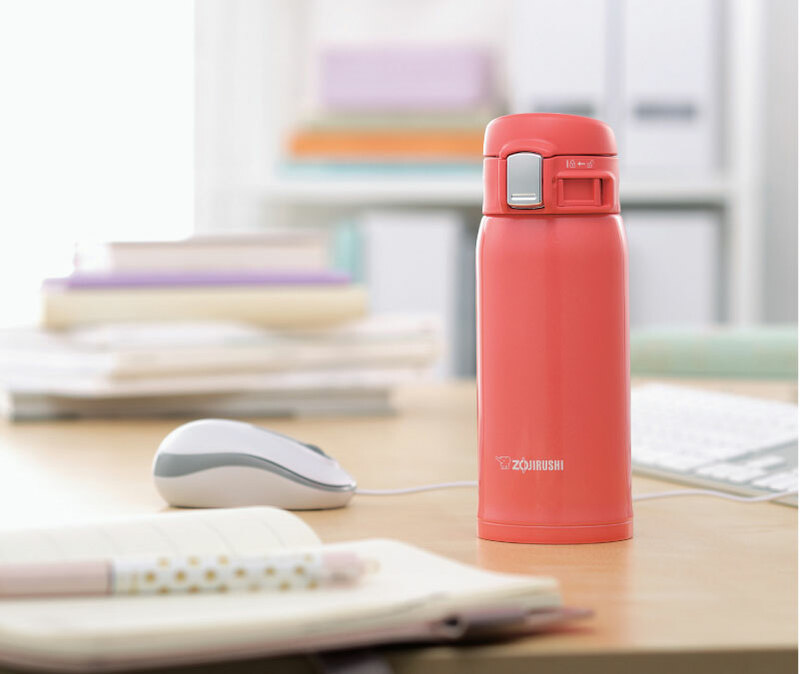 It comes in 12, 16 and 20 ounce capacities and is available in beautiful Coral Pink, Turquoise Blue and Slate Gray. The compact design takes up minimal space while maximizing capacity. 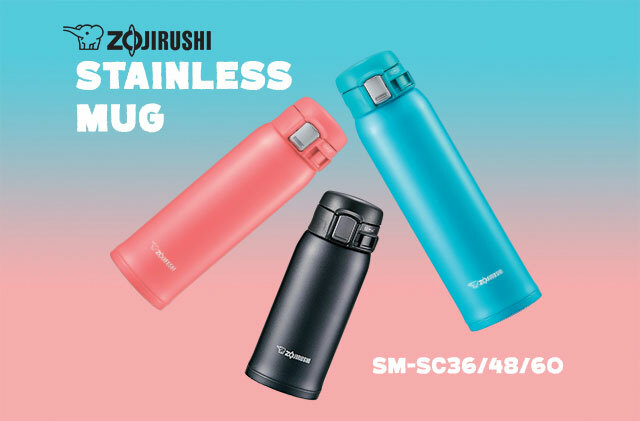 These durable mugs are made using high-quality 18/8 stainless steel and use Zojirushi’s superior vacuum insulation technology, which keeps beverages hot or cold for hours. Hot coffee and tea stay fresh, as do cold water and iced teas. The Stainless Mug has been designed with versatile features to fit various situations. The mug is highly portable, in part because of the unique lid design. 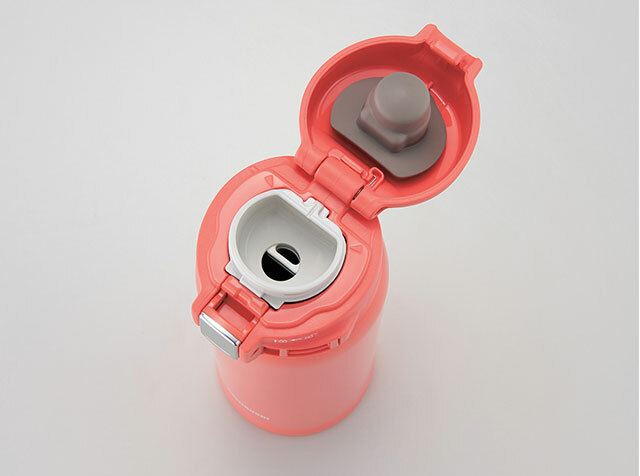 When used properly, the lid lock stops the lid from accidentally opening in your bag, and two gaskets keep the lid securely on the mug to minimize leaks and spills. The lid has a 2-step flip open top, which helps excess condensation fall back into the bottle so drops don’t flick out when the lid is opened. And an air vent on the mouthpiece allows beverages to flow out smoothly, without gushing or overflowing. The lid also covers the mouth area, keeping it sanitary. In addition, the non-stick interior coating makes the mug easy to clean, and the lid also completely disassembles for thorough cleaning. Finally, all areas that come into contact with liquids are BPA-free, and with a 1 ½ inch opening, the mug is easy to fill accommodates full-size ice cubes. We love this new Stainless Mug not only for its innovative features, but also because of the variety of beverages we can take in it. We’re avid tea drinkers here at Zojirushi, so we love taking hot tea with us on our morning commute. Hot Green Tea (Sencha) travels really well in our Stainless Mug and is a great way to start the day. Brew the tea at 175°F, and pour the strained liquid into the mug to keep it hot all the way to work. We also love drinking iced tea in our mug, and the hot sencha tea can be sweetened with a little bit of honey and poured over ice cubes to make Iced Green Tea (Sencha)! Check out these gorgeous mugs on our YouTube channel, and as always, share your photo with us with #mybottlemylife! Japanese Bento – Get ‘Em At Your Local Store! In case you can’t tell, we love bento! We’re continuing our Japanese Bento series this month with an entertaining look at where to find ready-made bento in Japan! Bento are quite often made at home to take to school, the office or outdoor events, but delicious bento can easily be purchased at shops, railway stations, convenience stores and department stores across Japan, too. During the late 19th century when Japan was going through the height of industrialization, travel by rail became commonplace and enterprising vendors began selling prepackaged bento at train stations. These bento were called ekiben, with “eki” standing for station and “ben” for bento. These types of bento made prepackaged, wholesome food available for workers and travelers outside of their homes, and the trend spread to vendors and shops throughout cities. Prepackaged bento became more and more popular, especially after World War II, and began to be sold in supermarkets. In the 1980’s, convenience stores started to sell bento boxes, and with soaring demand, dedicated bento shops opened, offering some of the most tasty and innovative combinations. These shops are sometimes open 24 hours a day! So where should you go for bento? 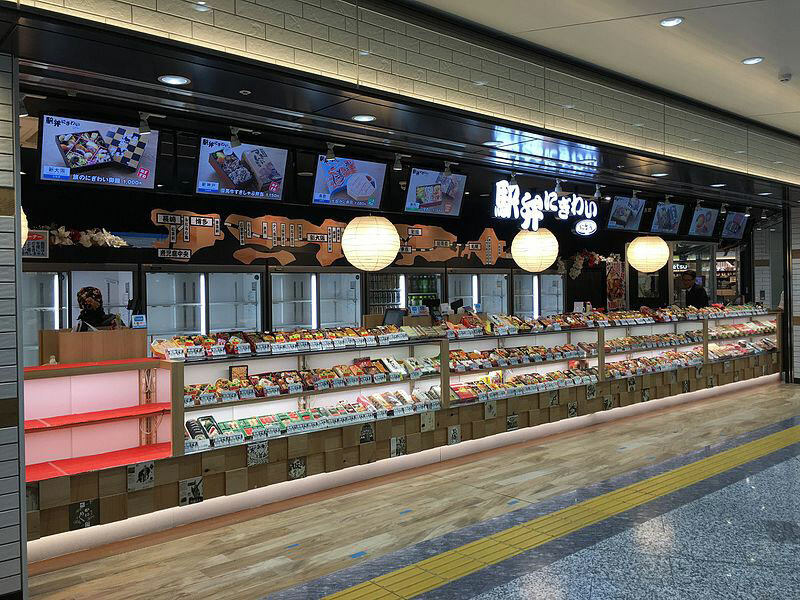 Konbini, or convenience stores, are ubiquitous and serve various combinations of premade bento, including hamburger patties, steak, karaage fried chicken and salmon, at an inexpensive price. In cold weather, tonjiru or miso soup with pork, and other soups are popular additions to a bento set. The nice part of getting bento from konbini is that customers can take the meal home or to the office and warm it up in a microwave. Bento shops serve freshly made bento along with prepackaged ones. 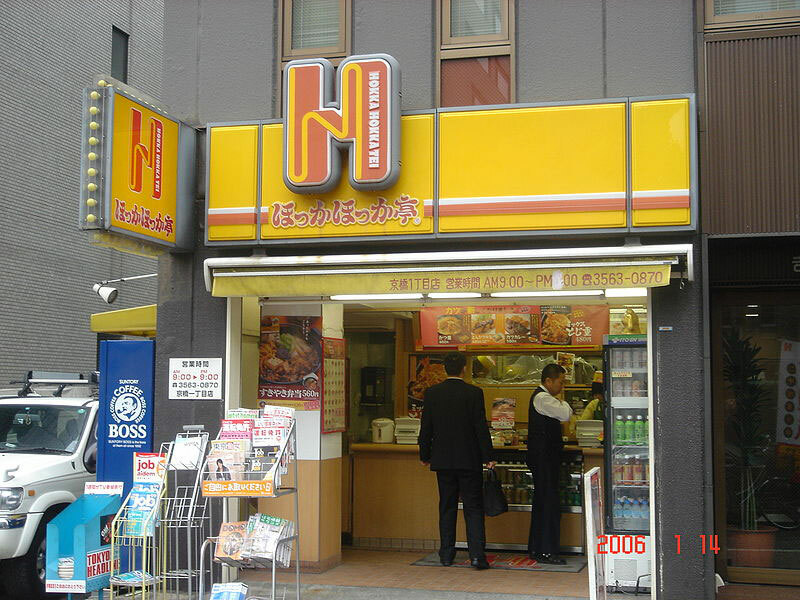 Some of the most popular shops in Japan are Hotto Motto, Hokka Hokka Tei, Origin Bento and Honke Kamadoya. These dedicated bento shops often allow customers to create their own combinations by selecting mains, sides and salads from the restaurant menu. Nori seaweed sets with grilled salmon, savory breaded tonkatsu pork and fried karaage chicken are often the most popular items. 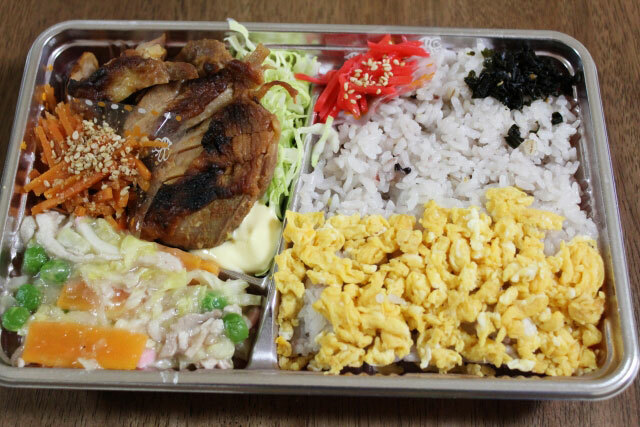 Served with pickles, salad, vegetable sides and rice, these bento from dedicated shops are the best takeout–and can be purchased at around ¥500 (or $5 USD)—in Japan! Supermarkets are onboard with bento as well. At the end of the aisles, in sozai (prepared side dish) corners, supermarkets in Japan also carry several bento that you can take home to eat. These bento often become easy dinners for many working people in cities. When looking for a fancier bento meal, depachika are the best places to go. 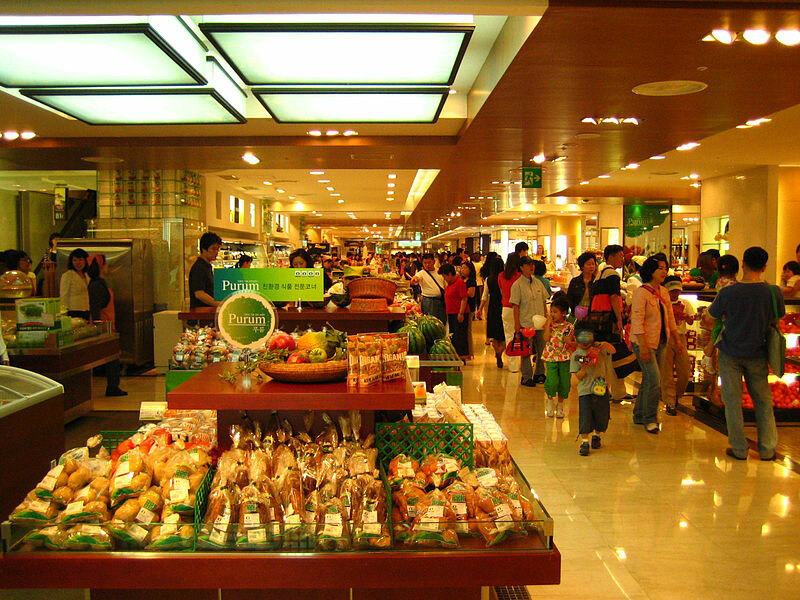 Depachika are the basement levels of department stores, where groceries, delis, gourmet food stalls, sweet shops, chocolatiers, alcohol and bento vendors are located. The bento found in depachika range from the kinds found at konbini and bento shops to fancier ones with premium items such as Kobe beef or matsutake mushrooms. 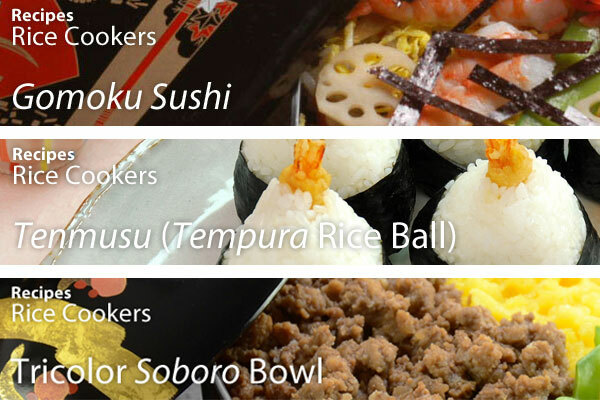 Depachika vendors are also constantly adding new and flavorful items to create innovative bento. While many customers pick up bento to go, some diners prefer to select their bento and enjoy the public eating areas, like small gardens or the store rooftops, for their meal. Some even call depachika a bento wonderland! Bento are very popular in Japan and they can be found at train stations or airports. Stay tuned for our post next month where we talk about ekiben and the types of the wonderful items in them! On the “mainland”, or what’s known as the Continental U.S. for those of us that live here, May 5th is an excuse to go eat tacos and drink horchata and pretend to be Mexican for a day, because, who doesn’t love Mexican food on Cinco de Mayo? 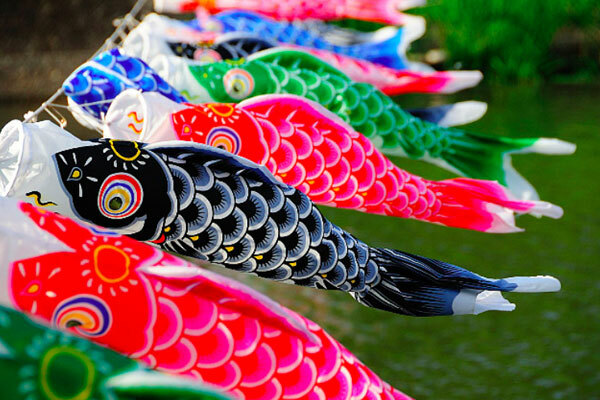 But in Japan and Hawaii, you’d probably see some colorful carp flying from poles that signify Boy’s Day; also known as Children’s Day in modern and more politically correct Japan. I’ve been flying carp at my house ever since my son was born, and I still do it today even though he doesn’t live with us anymore. I have four fish on my pole, which represent Dad, Mom, big brother and little sister. In 1948, Japan declared May 5th to be a national holiday, combining Girl’s Day on March 3rd with Boy’s Day to form Children’s Day, thus taking advantage of other national holidays during the same time and cluster them into a Golden Week. 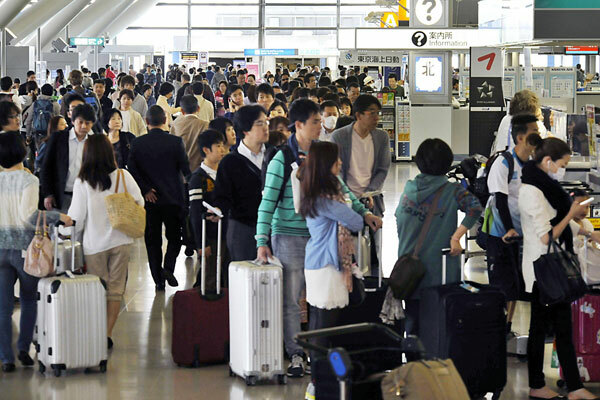 If you ever have a chance to visit Japan or live there—trust me, you do not want to test the crowds during this longest holiday period of the year. People can’t wait to get out of town quick enough, so the train stations and airports are jammed. I always thought the Japanese-Americans in Hawaii tended to hold onto their traditions more tightly than the Japanese do, which to me, is both charming and wonderful. Japan is just too modern in some ways. 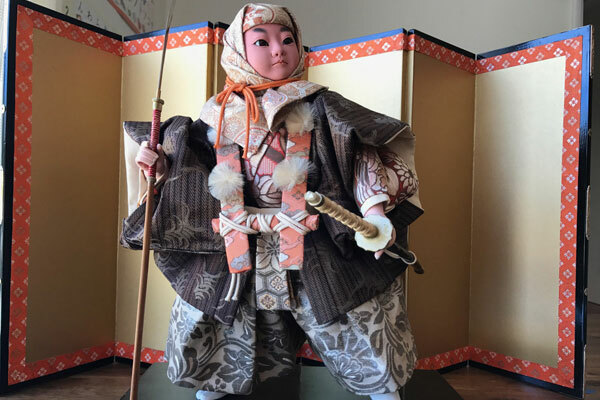 During my first Boy’s Day as a child, my parents gave me a traditional doll of a samurai warrior, which was supposed to convey strength, character and bravery—the trademarks of Boy’s Day. I still have the doll today, and it is awesome! Check out the detail on this thing! The warrior’s name is Benkei, a monk who served under Minamoto no Yoshitsune during the 12th Century. Benkei was a mountain of a man at 6’7” and legend has it that he died while defending his master’s castle while Yoshitsune was inside committing ritualistic harakiri. Knowing it was too dangerous to confront Benkei from up close, his enemies rained arrows on him from afar—only to see him still standing after doing considerable damage to his body. When the soldiers dared to get closer, they saw that Benkei was dead, but he had died standing up! Whoa—a super hero for sure! My Benkei has done a pretty good job of protecting our house up to now–I think I’ll pass him on to my son so he can protect his home, too. Even if you don’t have a samurai warrior doll of your own, you can still celebrate Children’s Day by making a paper samurai helmet with your kids. 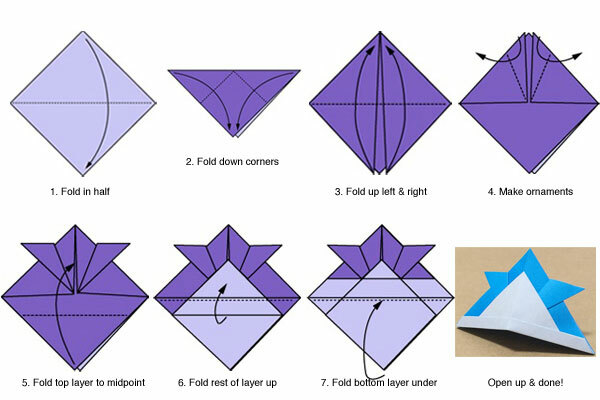 This classic origami pattern is called a kabuto, and is fairly easy to fold. If you start with a large piece of paper like newspaper, they can actually wear it on their heads—just make sure you start with a perfectly square piece, like you would any origami. And by the way, if you are a Star Wars geek like I am, you know that George Lucas was heavily influenced by Japanese historic culture. The kabuto is no exception—where do you think Darth Vader’s famous helmet shape came from? The traditional sweet treat on Children’s Day has always been kashiwa mochi, a kind of football shaped rice cake filled with sweet red bean paste. The dessert is then wrapped in an oak leaf, which symbolizes good luck for the new generations because old leaves don’t fall from the tree until the new ones sprout. Oh, that’s kind of deep if you think about it! 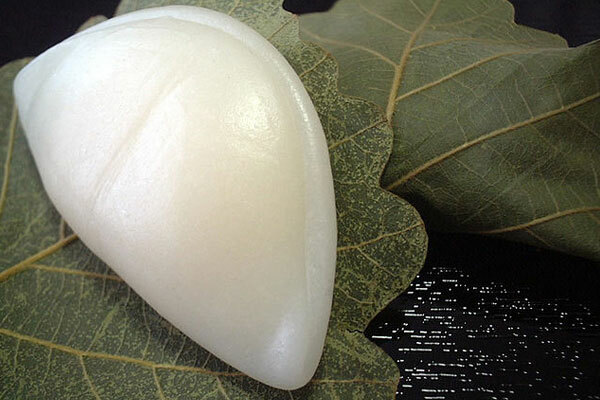 This is one of my favorite Japanese mochi desserts because the oak leaf actually imparts a kind of earthy fragrance to the mochi that is subtle, but quite nice.